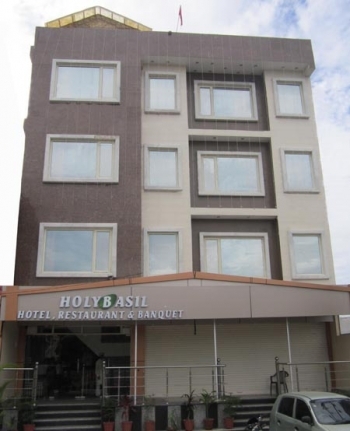 Hotel Holy Basil is a 2 star deluxe hotel in Haridwar, located at a convenient location. It is one of the perfect place for both business as well as leisure travellers to organize their business meet or to enjoy vacations with family and friends. 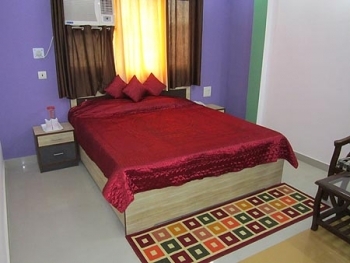 The rooms are specially designed to provide complete comfort to the customers. The hotel is like a home away from home. Guests can visit Mata Mansa Devi Temple, Mata Chandi Devi Temple, Daksh Prajapati Temple and many other religious places in Haridwar. Take a holy dip in river Ganges at Har Ki Pauri. Although Haridwar is known for sprituality, but there are many other attracyions other then religious places. Tourists can visit Rajaji National Park, which is at a distance of only 10 Kms from Haridwar. They can also visit Chilla Power House-a 144 MW hydro electric power generation at Haridwar. The hotel is located at Arya Nagar Chowk of Jwalapur on Haridwar Main road. Jwalapur Railway Station is at distance of only 500 mtrs from the hotel. The hotel provides well furnished rooms in 3 categories i.e Presidential Suite, Executive and Deluxe rooms with all modern amenities like AC, TV, Telephones etc. A well decorated Multi Cuisine Restaurant is available at the hotel to satisfy guests appetite. Enjoy vegeterian as well as non vegeterian meals at the restaurant. The restaurant provides Continental, Chinese and all kind of Indian dishes, prepared by expert chefs. Fast food like Pasta, Spring Rolls etc are also provided. - Doctor on Call, Laundry service, Parking facility, 24-hour room service, Tea/Coffee facility on demand. Business meets, Wedding parties, Conferences etc can be easily organized at the hotel Conference hall and Banquet hall. The hotel has conference halls according to your need, with capacity of 10 to 18 persons. The Banquet hall has a capacity for 800 persons. So guests can organize meetings, get togethers, product launch events, marriages, birthday parties or any other event. By Road: One can get a direct bus for Hardiwar from ISBT Kashmiri Gate Delhi. Buses are also available from Ludhiana, Chandigarh, Amritsar, Shimla, Haldwani, Dehradun, Rishikesh etc. So you can either board a bus for Haridwar or hire a taxi to Haridwar. By Train: Trains are available for Haridwar from various destinations in India. Shatabdi Express from Delhi, Lahori Express from Amritsar, Hemkunt Express from Jammu, Sangam Express from Allahabad, Upasana Express from Howrah are some important trains to or via Haridwar. By Air: There is a domestic Airport in Jolly Grant Dehradun, at a distance of 35 Kms from Haridwar. Daily flights are available for Dehradun from Delhi. So you can board a flight for Dehradun and hire a cab to reach Haridwar from the Airport.